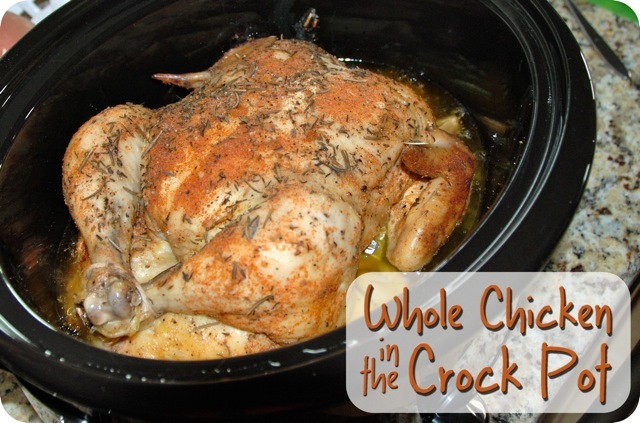 If you’ve been on Pinterest at all, I’m sure you’ve seen the crock pot “rotisserie” or “roasted” chickens, with claims of it being the most delicious ever chicken. I’d been wanting to try it for a while, and finally got around to it. I love my crock pot and everything it does. 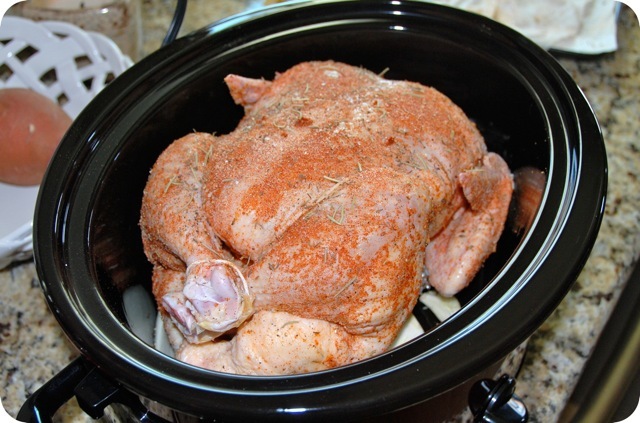 It’s so EASY, and it does something magical to chicken and other meat, making is so so so tender. Now, if you’re looking for that perfectly crisped roasted chicken skin, or the caramelized fat bits of a rotisserie, you might be disappointed by this recipe. It’s definitely not the same. 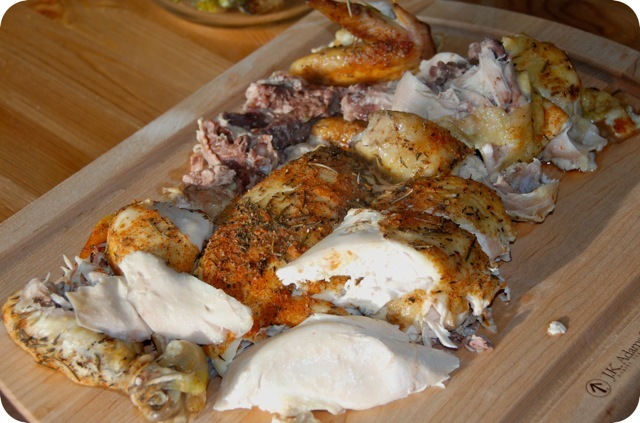 But if you are looking for a super easy way to prepare a whole chicken, with tender, fall-off-the-bone meat, this is definitely a winner. Mix the spices together in a bowl. Rinse the chicken and pat dry with paper towels. Rub the spice mixture onto the chicken. 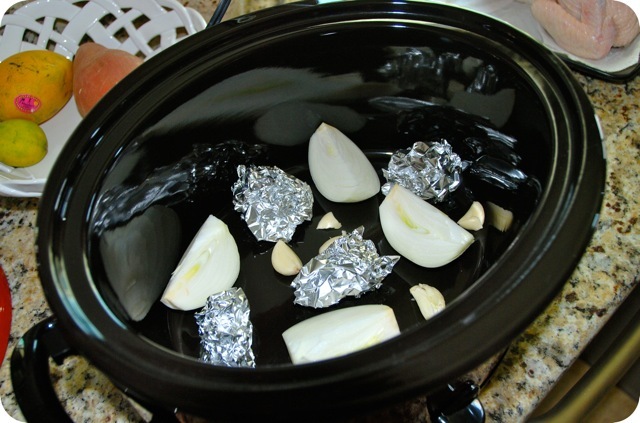 Place the onion, garlic and several balls of aluminum foil at the bottom of your crock pot. The foil will keep the chicken from sitting in its juices. Place the chicken atop the onion, garlic and foil. Cook on high for 1 hour, then turn to low and cook for 6 additional hours. I was somewhat worried about the chicken cooking all the way through in the crock pot, but it was definitely fully cooked and falling off the bone. I could hardly even cut it up, it was so tender! 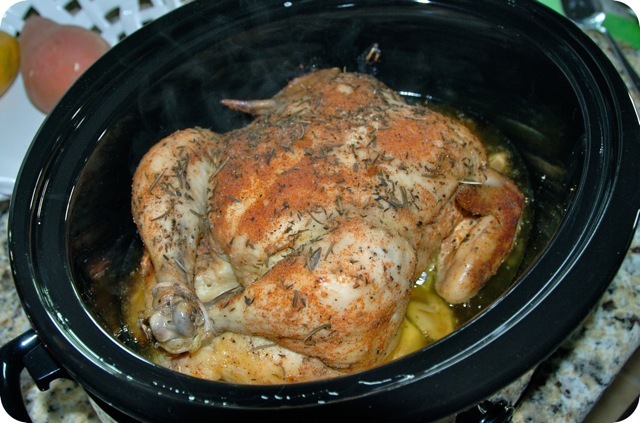 A true sign of a perfect crock pot meal! I would definitely make this again, but I’d try to rub some of the spices underneath the skin as well, for extra flavor. wow that looks amazing! I love the foil idea, going to give this a try.